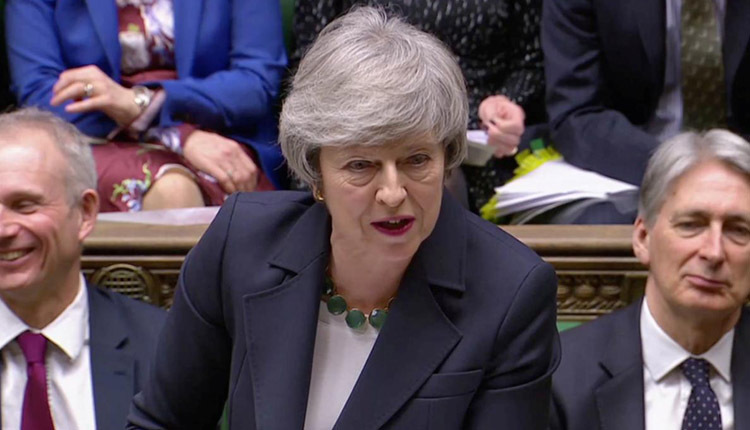 UK Prime Minister Theresa May was under pressure to set a date for leaving office as the price to bring Brexit-supporting rebel lawmakers in her party behind her twice-defeated European Union divorce treaty. At one of the most important junctures for the country in at least a generation, British politics was at fever pitch and, nearly three years since the 2016 referendum, it was still unclear how, when or if Brexit will ever take place. With May humiliated and weakened, ministers lined up to insist she was still in charge and to deny a reported plot to demand she name a date to leave office at a cabinet meeting on Monday. Rupert Murdoch’s The Sun newspaper said in a front page editorial that May must announce she will stand down as soon as her Brexit deal is approved and the United Kingdom has left the EU. “Time’s up, Theresa,” the newspaper said on its front page. The newspaper said her one chance of getting the deal approved by parliament was to name a date for her departure.